"The Legend Of Fearless Photog"
In a joint posting between MOTUCFigures.com and He-Man.org, my buddy John Atkin brings us an interview with the man... the myth... the legend- Nathan Bitner, winner of the original Create-A-Character contest and creator of Fearless Photog! Take it away John! In 1985, Mattel held a contest for children to submit their own character designs for the chance to have them become a "Masters of the Universe" action figure. Five finalists were chosen, and fans were able to phone and vote for their favorite character. 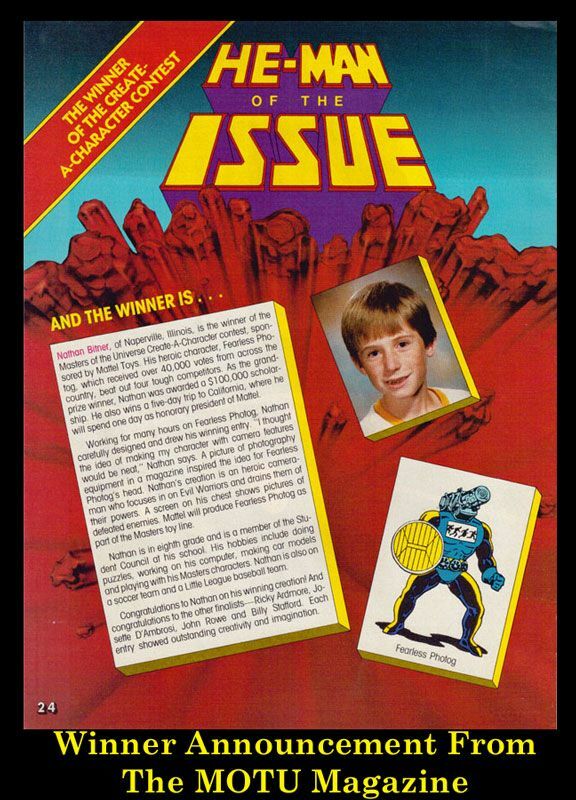 In the Spring 1986 issue of the Masters of the Universe Magazine the winner of the contest was announced. That winner was an 11-year-old boy from Naperville, Illinois named Nathan Bitner. His winning entry was a heroic warrior named "Fearless Photog", who received over 40,000 votes in a one-week period! 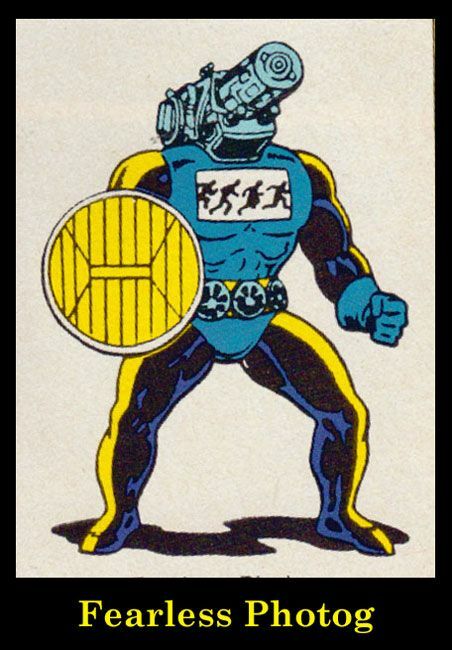 The character had a camera for a head, and his chest plate displayed silhouettes of his defeated enemies. His power was the ability to ‘focus in’ on his enemies and drain them of their evil strength, leaving behind only the good that they had inside them. For his winning entry, Nathan was awarded a scholarship for $100,000 and a five-day trip to Disneyland. Despite the contest's premise, however, Fearless Photog was never actually made into an action figure. For years, many fans of this character have wondered why he was never produced. In part one of a two part interview, I talked with Nathan about the contest and his creation, and he shared with me some of his memories. How did you find out about the "Create-A-Character" contest, and what made you decide to enter? I found out about the contest when I was reading the Sunday comics in the Chicago Tribune. It was on the bottom of the back page. I vaguely remember my Dad kept saying "scholarship", "scholarship", "scholarship" at about 10-second intervals, so I can't deny that he had some influence in me deciding to actually enter. I had thought of a few ideas and entered three of them. Photog was actually my second choice. A character that was inspired by Thor, and held a lightning-bolt shaped sword, was actually my favorite entry. I named him Cloud Chaser, and he was an evil warrior. As far as deciding to enter, I knew I was not a great artist, so I tried to sketch a couple and realized how easy the bodies were to draw. You can see how simple my shield was. Once I realized it could be fun and not take too much skill (they were just pencil sketches), I couldn't resist taking a shot at such a fun set of prizes. What was your reaction when you found out that you won the contest? There were actually two sets of reactions: one when I found out I was a semi-finalist and a second when I found out I had won. My parents surprised me with the first by taking me out to dinner and then presenting me with the letter from Mattel. I think I went berserk. I looked like one of the people on Publisher's Clearing House. I was completely incredulous. And it may sound crazy, but I think at the time I won, I was more excited about being President of Mattel for a day (and a cool vacation, including a trip to NYC to be on GMA, and to Disneyland/Mattel) than anything else. I was overwhelmed, thrilled, amazed, stunned ... I never thought I had any real chance whatsoever, because I just didn't feel like I had the art skills to compete with others. Even when I go back and look at a character like Brainwave ... I don't think my artwork was nearly as good as his. They never said this, but I have a feeling that my parents were pretty relieved that I had just received a "college fund". We were very middle-class and lived a bit above our means, so financially it was a relief for them. At the same time, they were of course very happy for me; they could see how excited I was. My friends had a range of responses ... I got a good bit of razzing. My school at the time (Thayer J. Hill Junior High - now "Middle School") was very proud of me and did some wonderful things ... but it was hard to ever live them down. The art teacher there led a class to create a beautiful cardboard replica of Photog, and the Principal read a poem on the intercom at the end of the day about the contest (my face turned 8 shades of red). Perhaps the craziest thing is that they had a "Nathan Bitner Day" at my school. While I was very grateful for their incredibly kind words and actions, I was teased for years ... when I was a junior in high school, I had freshmen who I had never met coming up to me and asking me about it. 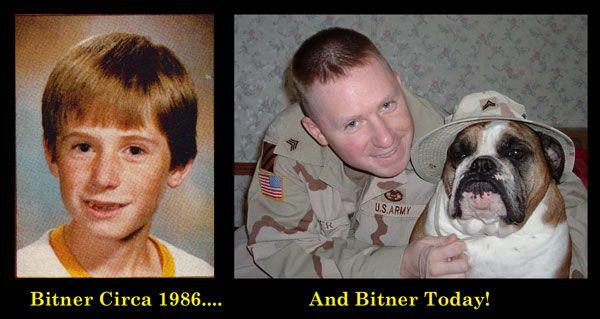 1986 was a crazy year! Your story appeared in magazines and newspapers across the country. How did you feel about all the media attention you were receiving at such a young age? I had mixed feelings about the attention. Not all of it was positive, and it created a lot of negative responses from people who barely knew me. On the other hand, it's a pretty cool thing for a kid to get the infamous "15 minutes of fame". Being on Good Morning America, in Newsweek, all of the newspapers, radio interviews, etc. – was very cool in a lot of ways. The day that I was on Good Morning America, I had just had interview after interview, and was horribly sick by the afternoon with a 103 degree fever. It was both fun and stressful at the same time. I learned then (and later) that no matter what you say, it will often get taken out of context and sometimes twisted, especially if it makes a better story. It's not easy to figure that out or deal with when you are 11 and 12 years old. How did you come up with the name Fearless Photog? I was very interested in sports as a kid, as were many of my friends. I liked the journalism side of it. When I was a kid, I would actually play some sports games by myself (Nerf basketball, football in the side yard) and "announce the game" to myself. Yeah, I know it sounds weird. I was a little bit of an eccentric kid. ;) Anyway, I knew that the guys with the giant cameras were called Photogs. I knew I wanted this character to be a good warrior with a humane side to him, and I wanted to somehow balance the goodness with at least some type of ferocity. "Fierce Photog" - even before the lingo of today - didn't sound right. "Fearless" was the word I finally settled on ... I was very much looking for the alliteration and wanted a strong word to balance him out. Is Fearless Photog a man or a machine? Also, is the camera his head, or is it a helmet of some kind? He is supposed to be a cyborg, in my vision, anyway. He is intended to have the exterior body of a human (skin) with the internal workings of a machine (no nerves or blood). At the time, I wanted him to have human muscles, but really didn't understand enough about anatomy to realize that it would be difficult to have muscle/bone without nerves and blood. Now that you ask it, it would be interesting to write a backstory to how he came to be. I honestly never considered it. He is intended to be cyborg - something like Data from Star Trek, or maybe more accurately, like Robocop. The camera is intended to be a mechanical head - an electronic brain and a device that drives the rest of his equipment (shield, chest) much like a central nervous system. It's not intended as a helmet. He is not supposed to have a human face under there. I wanted him to interact with others like a human (with emotions), but absolutely intended for his head to be a machine attached to other machines in his "body". The camera itself that makes up Photog's head was traced (I could never draw that!) from a National Geographic magazine. There was an article in the 1980s about new miniature cameras (surgical endoscopes) that could go inside a person's body and take pictures of their tissues from the inside. Since it was blown up for the article, I could trace it at full size and barely had to scale it down. Fearless Photog has the ability to ‘focus in’ on his enemies and drain their strength, and his chest plate displays silhouettes of defeated evil warriors. What was the inspiration for your character and his design? Even at 11, I was kind of tired of the same old thing in cartoons. I loved guns and swords and battles as much as the next boy, but I thought something a bit more creative or different might have a better chance of winning the contest. So, I decided to pretty much rule out violence for Photog (but not for my other two entries!) In fact, I decided to make him as humane as possible. No guns, but a camera (little did I know how scary THAT concept could be until I played the video game Fatal Frame!) Come to think of it, ‘Fatal Photog’ could be developed as an anti-hero, but I'm digressing. I grew up near Amish country in upstate New York, and knew that some believed their souls were captured by cameras (or at least that's what I was taught). This was the initial inspiration for Photog taking a "picture" of the enemy and draining the evil from them; leaving behind only the good. The evil soul from the enemy would be displayed on his chest, forever trapped, to remind others of his power, and as a "notch on the belt". Again, the chest was intended as a counterbalance to the sappiness of "draining the evil". He needed to be intimidating, and I tried to achieve that through the design of his head, his color scheme, and the concept of displaying "intimidating war trophies" on his chest for all to see. You won a $100,000 scholarship. How long did you have to wait before receiving the prize money? I won a "college scholarship" (which actually was just cash) that was to mature to $100,000 on the day of my 18th birthday. So, in other words, they put just over $40,000 in an account that would mature at a rate to equal $100,000 at that point. However, I went to college at 16 years old, at the University of Chicago. This wouldn't have been affordable without the scholarship money. So, we petitioned Mattel to release the money 2 years early, and they generously did so. This gives me an opportunity to thank Mattel for that and all that they did for me in relation to this contest. I never held any ill will against them (at all) for not being able to make Fearless Photog back then. They allowed me to start my college career at a great school and treated me wonderfully. They always have. So, at any rate, I withdrew the money at age 16 (it had to go to my father the first two years, because I was a minor). At that point it had matured to about $80,000. It was paid in 4 equal yearly installments (taxable), and the first 2 1/2 installments went directly to the University of Chicago, before I transferred to UNC-Chapel Hill, where I graduated many years later. You also won a five- day trip for you and your family to Disneyland. Do you still have many memories from that trip? I have more memories than I could ever list for an interview! The trip was amazing. I don't even know where to start; I probably have 15 stories I could tell. President of Mattel for a day ... I remember that I was wearing an almost identical suit and tie to the actual President. We sat through some meetings about Fearless Photog, and I was made to feel like I was "making the decisions" that the President made every day. I met "He-Man" (this guy literally looked like he had stepped out of the cartoon!) I got to see their company "store" where they allowed me to pick out a couple of toys. I chose Hordak's Slime Pit, much to my mother's discontent. I can assure you that everything from Transformers to calculators (oops) to Hordak himself got slimed in the next year. I had never been to Disneyland - that was of course fun, and we went to Knott's Berry Farm as well. The trip to California was the furthest I'd been from home, and just the second time I had been on a plane (the first was the trip to NYC to be on Good Morning America). I met Rick Dees (of the Weekly Top 40 ... hey, to me, he was famous!) in a restaurant. One of the funnier things is that the limo company that was driving us around was Prince Limousine. We were in the 4th car in their fleet, so our license plate read "4 PRINCE". Remember that this is 1986. Prince also happened to be in Southern California that week, so the reaction from other cars and basically anyone that saw the license plate was insane! We were occasionally mobbed! I could never find anything purple to wave out the window, but I was looking! ...And that concludes Part 1 of the interview! Stay tuned for Part 2 as John delves further into the Legend of Fearless Photog! Very good story. I want a Cloud Chaser too! Well, apparently you can't believe everything you read on the org. Glad to know he is still willing to talk about this! Good interview. I can't wait to read part 2. I'm sure you guys can make a better Cloud Chaser than I did at 11 ... or at 38, for that matter. Amazing interview!!! I am just becoming acquainted with the Fearless Photog/Nathan Bitner story, so this interview was a great find! Congrats to you, Nathan, for finally being able to see your figure made! It's certainly a great time for true enthusiasts of the toy line. You rock, Nathan! Thanks for FP! Thanks very much for your kind words, Wendy! I recently got the prototype in the mail from Mattel, and I'm thrilled that it's been made! I did not think that would actually ever happen. I was a 6th grader at Thayer J. Hill back when this happened. I remember the cardboard standup being in the art room and remember thinking how impossible it was that a kid could draw something that awesome. For years I'd look in the toy isle and check if there was a He-Man figure with the camera head! It's great to see this...takes be back to 1986! amazing! congrats from new zealand!!!! Was there ever a part II of this interview as promised?